Vitality Flooring features large 91 cm x 91 cm (3’x3′) modules or 30 cm x 91 cm (1’x3′) modules. The modules interlock on all 4 sides which allow the creation of a customised floor of virtually any configuration. 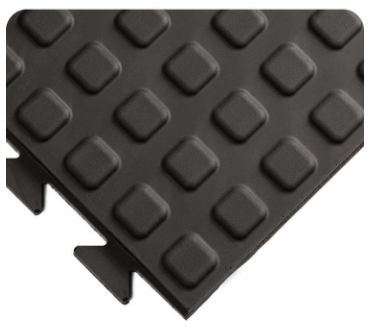 The interlock is incredibly effective and also hidden so the ergonomic floor you’ve created is seamless and stable underfoot. Having the ability to customise in 30 cm (1′) increments and finish off with bevelled ramps [yellow or black] sets Vitallity Flooring apart from all other Polyurethane anti fatigue flooring tiles.